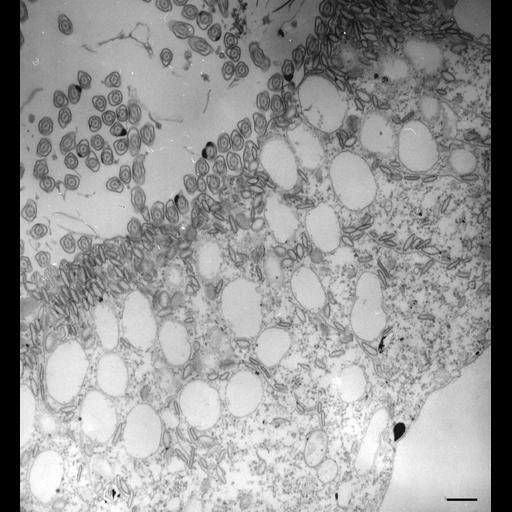 Two of the three types of vesicles that are transported to the cytopharynx and that accumulate in large numbers at the cytopharynx are shown in this electron micrograph. The discoidal vesicles move up to the edge of the cytopharynx membrane where the cytopharynx membrane is continuous with the plasma membrane of the buccal cavity. Here the discoidal vesicles fuse with the cytopharynx membrane. Just behind this edge is found a layer of larger vesicles, the acidosomes, which dock with the cytopharynx membrane as soon as they make contact with this membrane. Unlike the discoidal vesicles these acidosomes do not fuse with the cytopharynx or nascent vacuole until the phagosome has pinched off and moved toward the posterior pole of the cell. TEM taken on 4/8/83 by R. Allen with Hitachi HU11A operating at 75kV. Neg. 8,000X. Bar = 0.5µm. After a light glutaraldehyde fixation, these organisms were incubated in Gomori reagent to reveal the presence of acid phosphatase then dehydrated in alcohol and embedded in an epoxy resin. Microtome sections prepared at approximately 75nm thickness. The negative was printed to paper and the image was scanned to Photoshop. This digitized image is available for qualitative analysis. Additional information available at (http://www5.pbrc.hawaii.edu/allen/).